Critics Worry American Music College Is Being Sold So It Can Be Closed The newly disclosed sale agreement of Westminster Choir College to a conglomerate partly owned by the Chinese government appears to state that the prospective owners can close the school at any time. 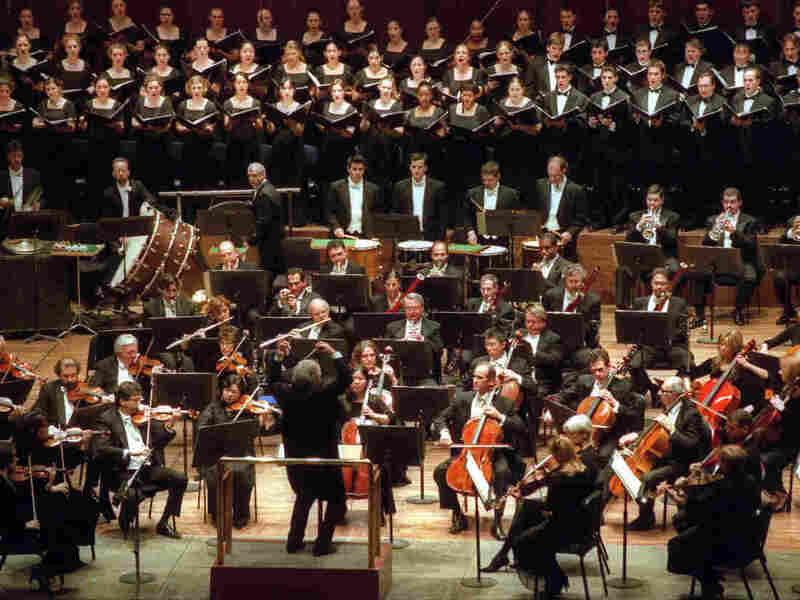 The Westminster Choir, performing with the New York Philharmonic and conductor Colin Davis in New York City in 2003. The ongoing dispute over the planned sale of a small music college in Princeton, N.J. to a Chinese for-profit company called Kaiwen Education — which is partly owned by the Chinese government — has escalated. The purchase and sale agreement of Westminster Choir College (WCC), which was signed last summer but not made public until last week, appears to give the buyers an opportunity to close the school, despite the company's assurances to the contrary. The nearly 100-year-old WCC merged with nearby Rider University almost three decades ago; in March 2017, Rider put the music school up for sale, citing financial stresses. In June 2018, Rider signed a agreement with subsidiaries of Kaiwen, which offered a $56 million package for the music conservatory. NPR has obtained a copy of the purchase and sale agreement, which was signed on June 21, 2018 by Rider University and a three-part buying group, including two for-profit subsidiaries of Kaiwen Education and a recently established non-profit called the Westminster Choir College Acquisition Corp (WCCAC). The agreement, which was written in both Chinese and English, says that after the completed purchase, the non-profit WCCAC will operate WCC in Princeton for no less than ten years, and that for at least five years, it will maintain the college's current academic offerings. However, the contract also offers the buying group a broadly defined mechanism to be released from those requirements. It says: "Buyer Parties shall not be obligated to continue any specific programs or the Programs of WCC, or to continue to operate or maintain the College, if the affected Buyer Party determines, in good faith, that such continued action would be substantially impracticable, economically infeasible or would substantially adversely affect WCC, its business, operations and/or the Acquired Business." A group of alumni and donors has filed a lawsuit to block the sale to Kaiwen, and is represented by lawyer Bruce Afran. He says that Rider University has claimed in both federal and New Jersey court filings that Kaiwen has promised to keep the school open for at least a decade. Larry Livingston, the interim president of the WCCAC, made similar statements to NPR in an interview last September. "The plan is that Westminster's mission will continue into the future and the choir college will substantially maintain the current academic program offerings for a period of not less than five years. And the commitment, of course, is to keep Westminster Choir College in Princeton for at least 10 years," Livingston said. "The goal here is to keep its mission, to keep it going as it is, for it to be a fabulous choir school and to help stabilize it and help grow it." The Westminster Foundation, a group of alumni, donors, faculty, and friends of Westminster Choir College which opposes the sale to Kaiwen, is also concerned about another provision in the newly revealed agreement, which states that the WCC's land in Princeton would be owned not by the school, but by the buying conglomerate's for-profit arm, who would in turn lease the property to the non-profit entity. Afran calls this clause a "brazen land grab." In a worst-case scenario, he warns, the for-profit buyers could close the school at any time, and then be sitting on a prime piece of real estate in Princeton. Along with the alumni and donors suit, another was filed by the Princeton Theological Seminary, which is arguing that Rider's plans to sell the school do not comply with the bequest of the donor who gave WCC its Princeton campus in 1932. The office of the New Jersey Attorney General, Gurbir S. Grewal, is also currently investigating the planned sale. Rider University contends that the clause that allows Kaiwen to close the school is not unusual. A Rider University spokesperson provided a statement to NPR on Monday which reads, in part: "The ability to modify, change, or discontinue academic offerings and programs because they are deemed substantially impracticable, economically infeasible or would substantially adversely affect WCC or Rider is the same right under which Rider has operated Westminster under the terms of the merger agreement entered into between Rider and Westminster in 1991. It is irresponsible to suggest that Rider entered into an agreement that allows the buyer to close Westminster at any time." Even so, critics of the deal have seized upon that clause as new cause for alarm. "Given such broad, unlimited terms, Rider is allowing the Chinese buyer to close the school for virtually any reason or under any pretext," Constance Fee, president of the Westminster Foundation, said in a press release issued Monday. The corporate leadership of Kaiwen has not responded to multiple requests for interview or comment that NPR has made over the past year. On Wednesday, the New Jersey Attorney General's office released a report on the proposed sale to Judge Paul Innes, who is presiding over the two lawsuits in New Jersey Superior Court that are seeking to block Kaiwen's purchase of WCC. The attorney general's report notes that under the terms of the 193os land donation, the campus must be continue to be used for the school's educational and religious training mission, or it will shift to the holdings of the Princeton Theological Seminary. The report also says that Rider University must prove that any sale of the conservatory would be "solely for the benefit of Westminster, including its current and future students and its faculty." The Westminster Foundation is hailing the attorney general's report as a victory. "The opinion," the group's attorney, Bruce Afran, said in a statement issued Thursday, "makes any attempt to sell the renowned music college almost impossible." In its own statement issued Thursday, Rider University said, in part: "The issues raised in the [attorney general's] letter do not come as a surprise as they are currently the subject of the pending litigations. The university will carefully review the letter and respond to the claims and issues through the court proceedings." Earlier this month, six New Jersey State Assembly representatives introduced a bill opposing the sale of WCC to Kaiwen, on the grounds of national security and academic freedom concerns. The next court date in the alumni and donors lawsuit is scheduled for April 15.